These Five Guys might replace Ben & Jerry as my best friends. Truly intending to make pollo al mattone I thought I had plenty of time to take a short nap and still make a tasty dinner. My "short" nap lasted 4 hours. What to have for dinner quickly? The captive husband suggested our new meaty paradise, Five Guys Famous Burgers and Fries. Normally this would be an occasion where loving husband gathers food and brings it back to his appreciative wife. This food doesn't travel well. The bag is soaked with grease after simply carrying it to your table. Waiting on the table are a pail of peanuts in the shell and a pail for said shells. Nice touch. The wrappings are reminiscent of take out diner food, foil sheet on the burgers, styrofoam cups (don't tell PETA) for fries. This is intentional to convince you this is YOUR local burger joint, not the successful franchise that it is or the McFranchise down the street. The burgers are even hand formed to play to the personal approach here. Don't even think about looking for a drive thru. The 'Have it your way' chain can take a lesson here. You choose from a long list of freebies - fried onions, A-1 sauce, jalopenos to name a few. The minimal bacon charge is worth it, it's crispy and salty and smokey. The fries are skin on twice fried 8th wonder of the world with ample malt vinegar on hand for dousing. Cooked in proper peanut oil. 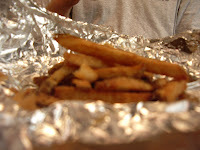 Most of the bag grease is attributed to an additional portion of fries scattered in the bag. Another nice touch. Altough I'm sure it's covered in the cost the appearance of more than expected is welcomed. The burger itself is beefy, and crispy on the edges from the griddle. You don't get to specify a doneness but these are about medium well. Still lots of flavor - cooked enough to avoid lawsuits. Notice the fact that they are thick enough to notice a temperature, not a thin line of gray meat stacked 4 high. Also the meat has never been frozen. This is integral for retaining juiciness even ideal freezing situations cannot accomplish. I'd estimate half pound total post cooking weight. No one's leaving hungry here. Maybe one day I can bring myself to order the only other item on the menu: a kosher dog. With all the griddles, I bet they are similar to Nathan's and wonderful. Forgoing my cheeseburger in paradise would be difficult at best. This place is the one and only place where I will not complain about a well-done burger. 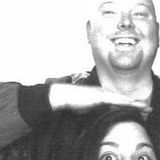 To borrow from Jules Winfield, "Mmm..that is a tasty burger!" My personal recommendation is the bacon cheeseburger with fried onions, sauteed mushrooms, and BBQ sauce. After a burger like this, I can only conclude that vegans are the willing Hellen Kellers of the culinary world. We have these "burger joints" here in Va beach, VA, but I've never been there, despite the raves of my son. Your description just may point me in the direction of the 5 guys! Thanks for commenting, Millicent. 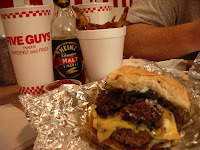 If you enjoy the food genre at all, 5 guys is definitely worth a visit as they were founded in your area!